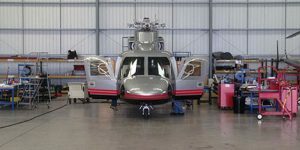 UK Aviation Services Limited is proud to announce that it has recently been authorized as a Sikorsky S-76 Customer Support Center with the authorization covering all variants of the popular S-76 helicopter. The Customer Support Center Authorization comes after considerable investment by UK Aviation Services in staff training, tools and equipment and a review of the company’s procedures and facility by Sikorsky. UK Aviation Services (Eng) Limited is a European Aviation Safety Agency (EASA) Part 145 and Part MG/MI approved organization with approval to maintain all variants of the Sikorsky S-76 as well as numerous other helicopter types. The company operates out of its 20,000 square foot private VIP facility at Blackpool Airport. UK Aviation Services recently imported a Sikorsky S-76C++ from the Federal Aviation Administration Register including upgrade of the avionics to meet EASA requirements. Amongst other things, this involved upgrade of the cockpit voice recorder (CVR) system to meet CVR/flight data recorder requirements and the installation of an Nginuity DAQ9000 digital flight data acquisition unit in place of the standard Teledyne unit. This allowed the installation to forgo the addition of instrument console cameras and saving the owner a considerable sum of money in the process with reduced future maintenance costs. It's now easier than ever to buy your Heli UK Expo tickets in advance. Save £5 compared to the on-the-gate price by booking online. Remember children under 16 years also get free entry when accompanied by an adult.